A new study has shown that more than half of British drivers don't feel confident changing a wheel. So why exactly is this once practical skill now a dying art? 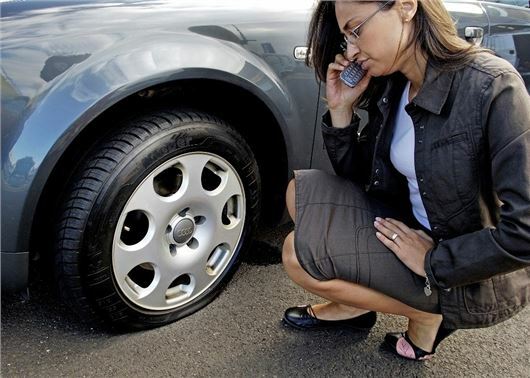 According to research by ClickMechanic, only 48 per cent of UK drivers feel comfortable changing a wheel, suggesting that millions of drivers on the road are becoming more reliant on breakdown recovery services. One of the sad truths about modern cars is the phasing out of the spare wheel, often replaced by a puncture repair kit. This decision to rid cars of the spare wheel is inextricably linked to emissions and tax. Heavier vehicles emit more CO2, so car manufacturers have been forced to make every gram count. Removing the spare wheel is an easy way cut not just a few grams, but a few kilograms. A typical 17-inch alloy wheel weighs about 20kg, which can add up to nine grams of CO2 to an average vehicle’s emissions. However many owners now struggle to change a wheel, as well as other parts of a car. The study shows that 43 per cent of people would be confident changing a fuse and 42 per cent happy to change a headlight bulb. But, perhaps unsurprisingly, the over 55 age group were more confident with maintaining their vehicles- averaging over 50 per cent in both instances. "Changing a tyre used to be a rite of passage that your dad shows you how to do. However, that isn’t the case anymore and it’s partly down to the generational gap. The older generation are more likely to own a car and maintain it, but millennials are more interested in having a car when they need it. So they don’t learn the skills that used to be taught, like changing a tyre", said Tim Shallcross, the Institute of Advanced Motorists’ (IAM) top technical advisor. So, are modern drivers less capable than older drivers? Well, not conclusively. Aside from spare wheels being less commonplace on modern cars, there's a few factors. A lot of drivers know how to change a wheel in theory, but when it comes to the task it can be a bit confusing. The RAC carry out 1000 - 2000 wheel changes on a typical day, which represents about 1/3 of the breakdowns they attend. RAC spokesperson Pete Williams said, "Understandably most drivers are not familiar with the mechanics of their vehicle and very few will attempt anything but the simplest maintenance checks. So it is not surprising that seeing someone changing their own wheel is becoming less and less common a sight on the nation’s roads." However, that isn't such a bad thing. Multiple industry experts are among the opinion that if you're on a busy road, like the motorway, the safest thing to do is pull over and wait for a recovery vehicle rather than trying to change the tyre yourself. To be fair, changing wheels is discouraged on major roads and motorways, so it's best to call the recovery, though it just suggest becoming a member of such an organisation is worth the money. I think part of the problem with other tasks is that the normal "life" of many parts is so long these days that they just never need changing, I have driven for nearly 40 years and I can only remember having to change a bulb twice. In the last 15 years (ownership of my current car - about 75k miles) I have not had to change the wheel, so I would be "out of practice". 1 If you use the "repair kit" does this affect the ease with which a Quick-fit type tyre place can repair the puncture - or is the repair permanent? 2. If I still have the original spare tyre in my car, will it be "out of age" and need replacing? I notice tyres have an age marking on them - presumably that is because they can age-expire? Had to change a wheel about a month ago for a female colleague who was driving. This was on the A55 south of Chester, fortunately it was the nearside rear and I was protected from the fast moving traffic. Took about 10 minutes once I had removed goods from the boot to get at the jack etc! Probably the first time I had changed one for at least 20 years! Brain just went into memory mode! The Italian driving test includes jacking the car and changing a wheel, not necessarily during the test but you need to show a certificate to confirm you've managed to do it a bit like the theoretical part of our test. Many modern wheels "weld" themselves to the hub with corrosion and can be almost impossible to remove. It is not as simple as it used to be. There is so much traffic on the roads that I so not travel on roads with traffic light enough so that I would attempt it myself. All the punctures I have ever had (bar one) in my driving career have been of the very slow type. If your wheel nuts are too tight for you to undo - simply put the brace on the nut so the arm is horizontal to the ground,then use the jack to lift the brace.Showed this to my daughter 35 years ago and she has twice helped people with this problem. When I was a tyre fitter, many moons ago (1977), we used to undo and tighten the nuts up by hand. Even then we had to sometimes put a bar on the tyre spanner to 'crack' (loosen), the nuts initially when changing a tyre. Now they are done up with power tools and a torque wrench I imagine that it would be difficult to undo them at the side of a road. See my previous reply just above. I am quite capable of changing a wheel and have done it many times in the past, we teenagers had to look after our own cars. I am not sure I would wish to do it now on very busy roads, rather wait for rescue. Changing a light bulb used to be easy now sometimes you have to take half the car to pieces just to gain access. I broke down with a flat tyre in Halfords car park a few months ago. I am an OAP and not one person offered to help me replace my normal size wheel with a space saver wheel. As it happened the space saver wheel was only half inflated. My slow journey to the local tyre fitter was only interrupted once by a kind sole telling me that my tyre was flat. That was on a journey of over five miles on local roads on and around Blackpool. Changing the tyre was easy but expensive as I had only the week before replaced that particular tyre with a brand new one. I suppose that one should be ready for whatever life throws at you and don't expect someone else to help you. Bad luck here. There are many good uns who'd have stopped to help. But I'm disappointed that Halfords didn't leap to your rescue. Did you ask them? Wheels / tyres are getting bigger and heavier, esp. SUV's and the such. I would never buy a vehicle that I could not physically change the tyre on. Problem one, the wheels can be so tight that the wheel brace the car manufacturer supplies you is not up to the job of undoing the torqued up wheel nuts, and if you are of the female of the species with less muscle power even more difficult. Point two, most wheels I have removed from my cars have to be "broke" away from the drive plate which either needs a good kick or a large rubber hammer to disturb, again not an easy task. Point three, as stated above a good percentage of cars come with no spare wheel or get me home wheel and instead the manufacturer supplies you with a destructive tyre repair aerosol which when used on a tyre, according to the AA, has a 5 to 10% chance of working and then it ruins your tyre from the inside and you have to purchase a new one, more often dearer than the cost of being insured with a breakdown service. Point four, if a driver is not trained in how to SAFELY jack up a car and remove nuts and the wheel then it can be a perilous operation and could finish with the car falling off the jack and possibly hurting oneself. So all in all I don't blame drivers for calling out the breakdown recovery service, who now I believe carry spare get me home wheels for most cars. My late partner and I have changed many wheels after flat tyres over the years, but we had to call the emergency services a couple of years ago after a blowout in France as the wheels were just too big and heavy for us to handle on our Jaguar XF with a combination of blood pressure, heart problem and knee and back problems between us. In the past I have changed the wheels on full-size US cars, but no longer. I have to say that Jaguar Assist were wonderful at looking after the two old boys! At least the space-saver introduced the car to the inside lane. I am 70 and suffer from osteoarthritis and heart failure, getting down to do it is a strain now, allways did such things myself to date but many years since I had to change a wheel. Maybe motoring organisations should lower annual fee and have say £20 for each callout to encourage people to do it. Wheel change, tyre check & pressures, checking oil, fluids and screenwash should be part of test. In a recent episode I would have been quite happy (and able) to change a wheel - if only Ford had seen fit to provide a spare! I hit a rock in the gutter of a country road (it was either that or the enormous livestock lorry coming the other way). The "re-inflation" kit was of no use whatsoever as the sidewall was trashed. Hello recovery!!! I have tried to purchase a spare but none is small enough to fit the space under the boot floor. The space is wheel-shaped but just too damned small. It is quite sad when on many occasions I see a car with a puncture at the side of the road and a guy standing looking lost at what to do or someone messing with these silly tyre foam pumps ,It seems that the average man these days does not have the basic skills a lot of this goes back to school education everyone doing media studies and arty stuff etc when I was at school we did metal work woodwork etc and learnt DIY skills these days everyone wants to work in an office and not get there hands dirty so now we have a none practical generation lacking basic skills . As for the modern car not having a spare wheel it is plain stupid it should at least have a space saver to get you home ,when people use tyre foam in the unlikely case it works when the puncture is taken for repair the tyre has to be renewed a lot of people don,t seem to know this ,car makers save on wheel brace,jack,wheel and tyre plus saved weight and replace it with tyre foam ( three year life before renewal ) and all these added breakdowns are then put on the AA,RAC etc which up there costs . Most cars don't don't have a spare these days so it's not surprising people don't know how to change a wheel. In fact how many times have you had to change a wheel in the last 20 years? I've done it once because the tyre was damaged but apart from that I get my tyres checked by the garage when the car is serviced. My car has a space saver but I've removed it now to save fuel. Get a repair kit from Halfords or wherever and forget it. I do not understand how the weight of a spare wheel is going to add 9 g CO2. To What? If the author means that CO2 emissions will increase by 9 g CO2/km, then I understand, but totally disagree with the figure. It is a widely held belief that extra weight in a car will increase fuel consumption. It may, but it is not inevitable. It depends on the driving style of the driver. Even if it does have a negative effect, an increase of 9 g/km is doubtful. Take a car which averages 45 mpg. If it is petrol powered, it will emit roughly 147 g CO2/km. If an extra 20 kg increases that by 9 to 156 g/km, that is equivalent to a fuel economy figure of 43mpg, a reduction of just under 5%. That extra 20 kg, somewhat less than 2% of a typical car will not affect air resistance, rolling resistance or engine efficiency. It is thus improbable that such a small increase in total vehicle weight should have such a large effect on fuel economy under normal driving conditions. Where extra weight does have a negative weight is when you do a lot of braking - and that occurs during the extra urban part of the EU economy tests. So leaving out a spare might reduce emissions sufficiently to drop an emissions band, but it will not be reflected in the driver's experience. Therefore, R.L. Nunn may safely put his spare back in the car without worrying about its effect of fuel use. Even a space saver spare is better than a repair kit since it will not ruin the punctured tyre, and be more reliable. My wife and I both run BMWs fitted with run flat tyres, I purchased a spaces saver and Jack for my older model and we both carry good quality foot pumps along with a suitable extension wrench to deal with the wheel nuts. A couple of years ago while returning home to Scotland from Dorset I had a puncture in one of the run flats near to Manchester due to weather and road conditions I was unable to change the wheel, however by using the foot pump when safe enough to do so I was able to get to my home address. A tip if the wheel won't release is replace the wheel nuts but do not tighten them up lower the car and move it back and forward a couple of feet that should be enough to break the bond. Good tip also see my previous post above. :Millennials.... don’t learn the skills that used to be taught, like changing a tyre", said Tim Shallcross, the Institute of Advanced Motorists’ (IAM) top technical advisor. Methinks the man in street has a better idea that the 'Top Technical Advisor'! Better tyres; fewer punctures, flimsy jacks and hard-to-find jacking points; traffic passing within a metre or so; the risks of getting it wrong with the spare coming off causing an accident; tight bolts... I can't understand why the Top Advisor wants people to do it. Sounds like Shallcross is a moustachioed buffer harping back 100 years - when men were men. Changing a wheel on anything other than a country lane? No thanks, that's what I pay AA to do. They can set up beacons or tow me to a safe place. As a now retired driving instructor, I felt it part of my job to teach all my pupils how to change a wheel!